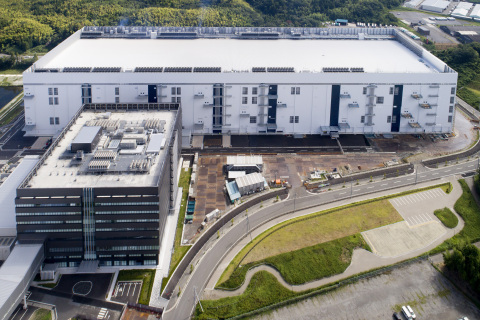 Toshiba Memory Corporation and Western Digital Corporation (NASDAQ:WDC) today celebrated the opening of a new state-of-the-art semiconductor fabrication facility, Fab 6, and the Memory R&D Center, at Yokkaichi operations in Mie Prefecture, Japan. Toshiba Memory started construction of Fab 6, a dedicated 3D flash memory fabrication facility, in February 2017. Toshiba Memory and Western Digital have installed cutting-edge manufacturing equipment for key production processes including deposition and etching. Mass production of 96-layer 3D flash memory utilizing the new fab began earlier this month. Demand for 3D flash memory is growing for enterprise servers, data centers and smartphones, and is expected to continue to expand in the years ahead. Further investments to expand its production will be made in line with market trends. The Memory R&D Center, located adjacent to Fab 6, began operations in March of this year, and will explore and promote advances in the development of 3D flash memory. Toshiba Memory and Western Digital will continue to cultivate and extend their leadership in the memory business by actively developing initiatives aimed at strengthening competitiveness, advancing joint development of 3D flash memory, and making capital investments according to market trends. Western Digital creates environments for data to thrive. The company is driving the innovation needed to help customers capture, preserve, access and transform an ever-increasing diversity of data. Everywhere data lives, from advanced data centers to mobile sensors to personal devices, our industry-leading solutions deliver the possibilities of data. Western Digital® data-centric solutions are marketed under the G-Technology™, HGST, SanDisk®, Tegile™, Upthere™ and WD® brands. Financial and investor information is available on the company's Investor Relations website at investor.wdc.com. Western Digital, the Western Digital logo, G-Technology, SanDisk, Tegile, Upthere and WD are registered trademarks or trademarks of Western Digital Corporation or its affiliates in the U.S. and/or other countries. Other trademarks, registered trademarks, and/or service marks, indicated or otherwise, are the property of their respective owners. This news release contains certain forward-looking statements, including statements regarding Fab 6 and the Memory R&D Center, the joint ventures between Toshiba Memory and Western Digital, the development and production of 3D NAND technology and products, demand for 3D NAND and positioning in the 3D NAND market. There are a number of risks and uncertainties that may cause these forward-looking statements to be inaccurate including, among others: volatility in global economic conditions; business conditions and growth in the storage ecosystem; impact of competitive products and pricing; market acceptance and cost of commodity materials and specialized product components; actions by competitors; unexpected advances in competing technologies; development and introduction of products based on new technologies and expansion into new data storage markets; risks associated with acquisitions, mergers and joint ventures; difficulties or delays in manufacturing; and other risks and uncertainties listed in Western Digital’s filings with the Securities and Exchange Commission (the “SEC”), including Western Digital’s Form 10-K filed with the SEC on Aug. 24, 2018, to which your attention is directed. You should not place undue reliance on these forward-looking statements, which speak only as of the date hereof, and we undertake no obligation to update these forward-looking statements to reflect subsequent events or circumstances.